Another hot and sunny weekend and so to another museum. 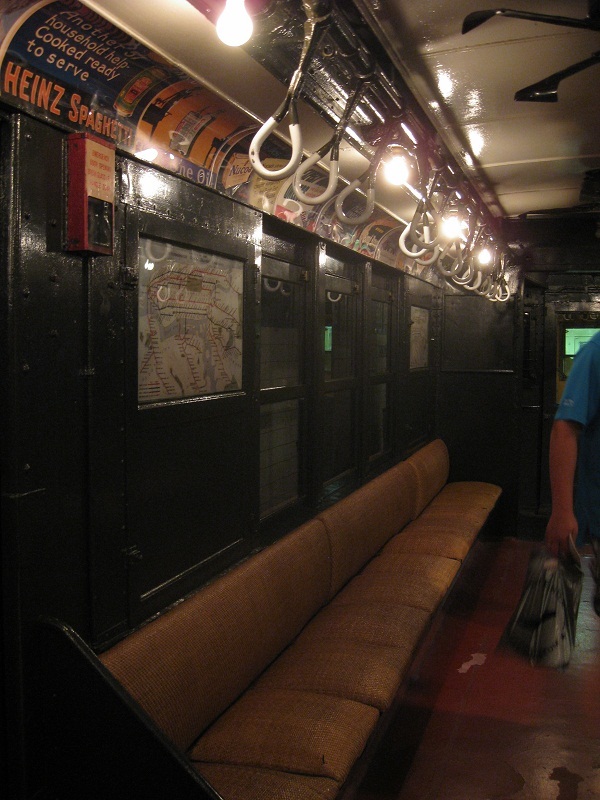 Whilst we’re living in Brooklyn it makes sense to see as many of the local attractions as we can, so we decided to visit the New York Transit Museum to learn all about the subway system. 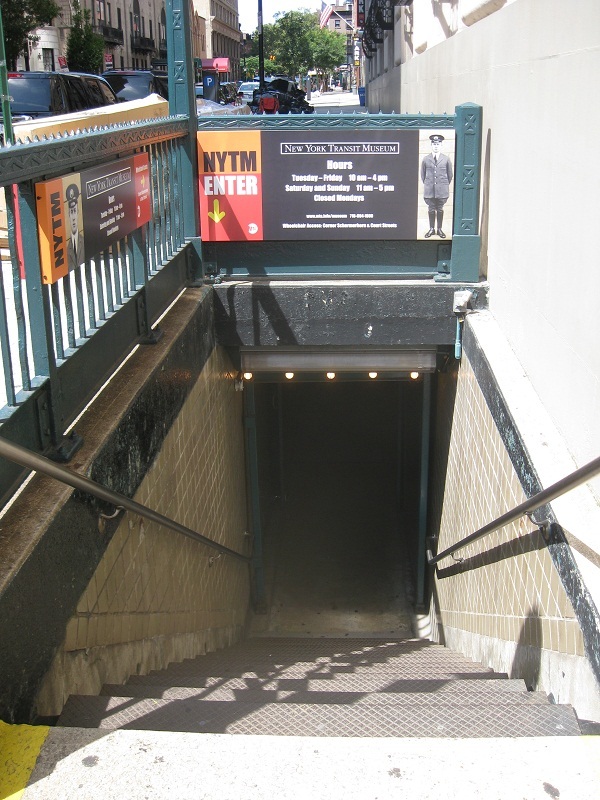 The museum is housed in a disused subway station which was built in the 1930s, and remains connected to the live tracks. 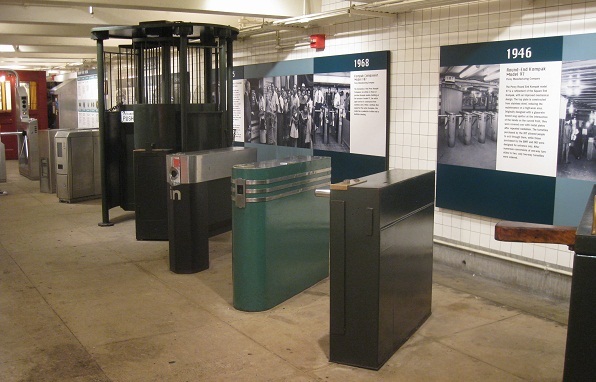 The visit begins on what would have been the concourse level, with a walk through exhibits describing how the subways were built. These are illustrated with lots of historic photos and a selection of old tools too. 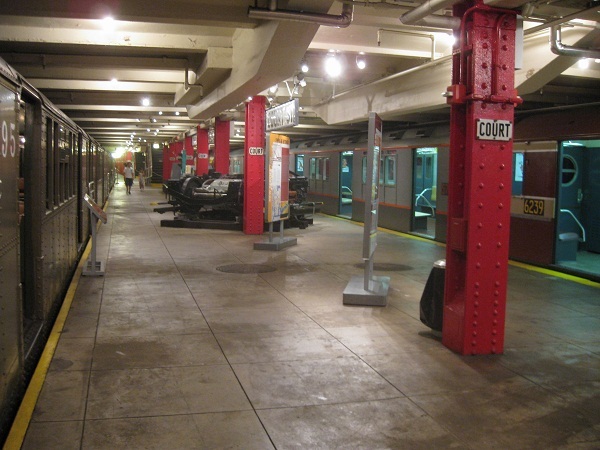 Having learned a bit about how the tunnels were (and still are) built you then have the option of descending to track level to look at examples of historic subway cars, or looking around the rest of the museum – a temporary exhibition space and a large gallery devoted to the history of New York’s buses. Quite by chance we had arrived in time to catch most of a(n excellent) free guided tour, so were taken downstairs to learn all sorts of genuinely fascinating facts about the subway system, illustrated by the carriages on display. The first one we saw was actually used on one of the elevated railways which predated the subway system, although the design was copied quite closely for the underground trains. It was interesting to note that the carriage designs have changed very little since the earliest days, although refinements have been made in terms of materials, and thankfully air circulation is no longer achieved by means of fans suspended from the ceilings. I think this carriage dates from around 1916 – we didn’t look at them in chronological order so I rather lost track (so to speak) of which was which – it’s definitely pre-1930, anyway! Those familiar with the NY subway map will be aware that instead of names the various lines just have either letters or numbers. Originally the lettered and numbered lines belonged to different companies, which set up in competition for business. 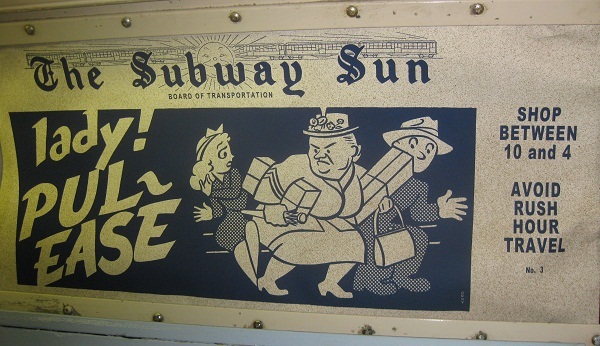 Although all the lines are operated by the MTA today, it is still the case that the number trains are narrower than the letter ones (which we hadn’t noticed until it was pointed out). Both companies used the same track gauge as each other (and as standard above-ground rolling stock), but the company which ran the number trains decided that in order to make sure standard trains couldn’t compete on their lines they would make their trains and tunnels smaller. The letter train company retaliated by using their larger trains as a selling point of their own. Tom was enchanted by the old signal board, which is still live, and we spent some time watching lights flashing as trains passed along the tracks it monitors. We then had fun playing with some of the interactive exhibits in the gallery upstairs, before taking a brief look at the buses and admiring the row of turnstiles through the ages on our way out. All in all this was a most enjoyable way to spend a couple of hours. If you’re ever able to visit I’d recommend it, but do try to catch one of the guided tours – there are lots of display boards explaining everything but our guide really brought it all to life. For the armchair traveller, the museum’s Wikipedia page is hugely informative about the museum and its collection, and also records many of the technical details I failed to take in! This entry was posted in Museums/galleries and tagged Brooklyn, subway by Emma Davidson. Bookmark the permalink. And yet you wouldn’t come with me to Crich Tramway Museum! I know! I did mention that to T when he suggested going!